Trump with a Turban Releases Secret #2 to Be Happy and Wealthy Like Him! How to be happy and wealthy is very much related to having a clear mind free of grudges. Letting go of grudges is one of the top secrets to being happy in life. The difference between successful people and others is not a lack of strength, but rather a lack of a positive frame of mind. Not holding a grudge frees the mind and gives more time. In a sense, not remaining angry or disappointed will make one a more productive person. Learn to view “letting go” in a positive way. Doing this helps one become a better person just by altering actions and habits. Everyone is familiar with the expression “Forgive and Forget.” Well, why not do it? So much time and energy is wasted being aggravated, especially when this involves someone you must communicate with. In such instances, your inability to talk to, or otherwise effectively communicate with another coworker decreases efficiency. Not being able to forgive creates other problems, what started off as a simple argument transforms into not performing as well at the workplace. This makes a small problem much larger, all because a situation was handled ineffectively. Similar to anger and negativity, not letting go of simple things and disputes, starts a destructive chain of events. This, clearly, is not good for anyone. It’s been said that the one who cannot forget an incident has a mindset far worse than the one who was initially wrong. Remember, resentment is a negative, unproductive and, often harmful emotion. Learn to cultivate good habits and do not forget to put forgiveness towards the top of the list. 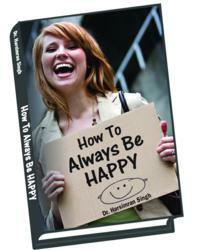 Author of the book, "How to Always be Happy" Dr.Harsimran Singh, Ph.D. migrated to the USA in 1973 with just $8 in his pocket.